Need the flexibility and control to manage large-scale deployments? Private colocation suites are available in the London market. Interested in more information or a tour of our LONDON data centers? As the world’s largest financial center and one of the world’s cultural hubs, London’s bustling economy and cosmopolitan status hardly need any introduction. Located near Heathrow Airport and a short walk from the Underground, INAP’s fault-tolerant facility offers ample data center space in the heart of the city and features a concurrently maintainable design. By utilizing free cooling and phased modular architecture design, it offers an energy-efficient design that operates at the highest standards. 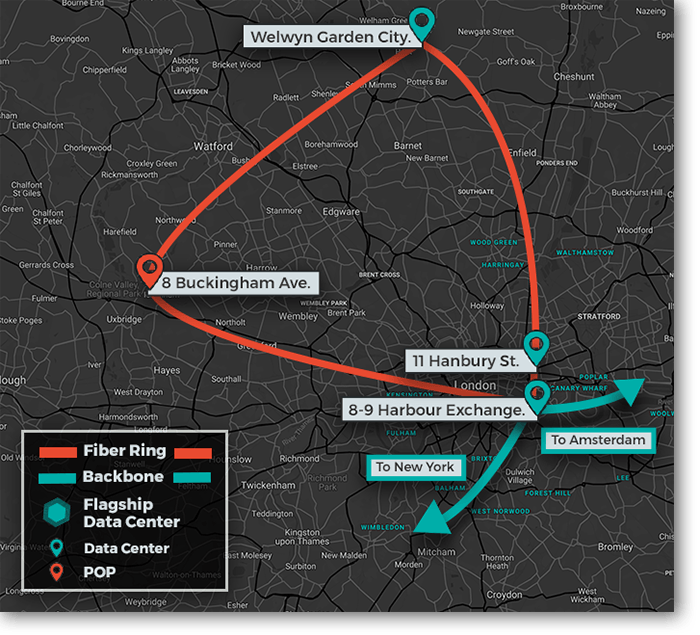 Our London data centers connect to Amsterdam and New York via our reliable, high-performing backbone.